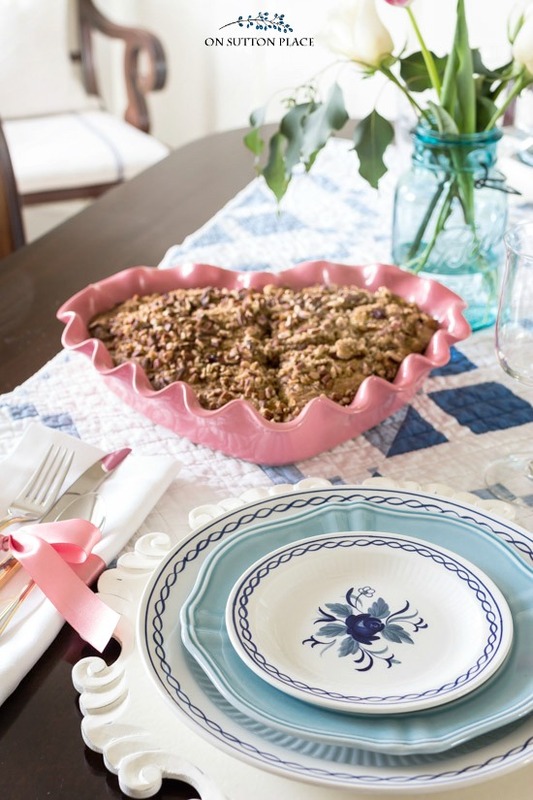 Use these farmhouse inspired Valentine’s Day tablescape ideas to celebrate the day with family or friends. 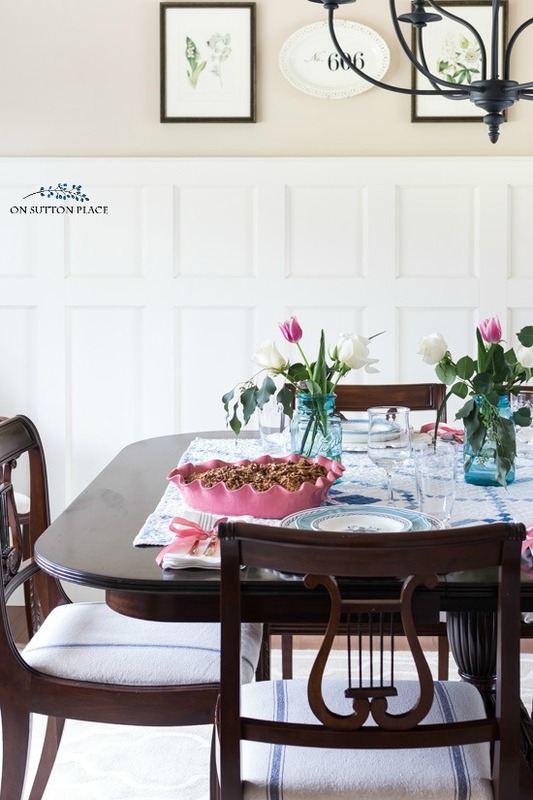 Easy & inexpensive ideas to use year-round. Welcome to another edition of our Styled & Set Entertaining Series hosted by Lory from Designthusiasm. Lory is also the brains behind our Home Style Saturdays feature. Even though we have never met in person, she’s such a good friend and I’m happy she invites me to hang out with her. All the other links on the tour will be at the end of the post. If you are coming over from StoneGable, welcome! 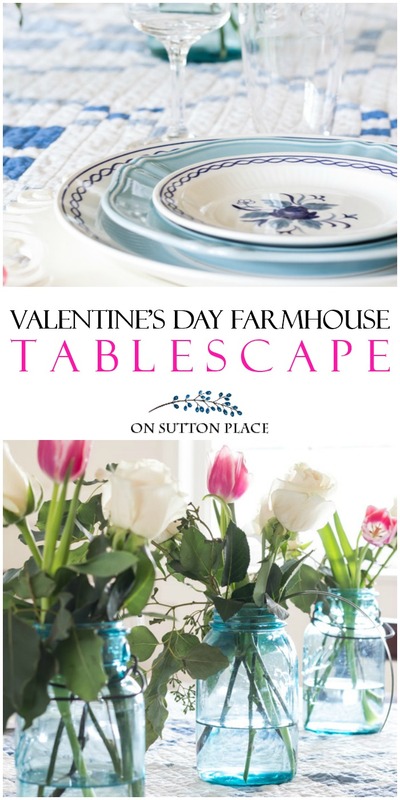 Now on to some farmhouse inspired Valentine’s Day tablescape ideas. 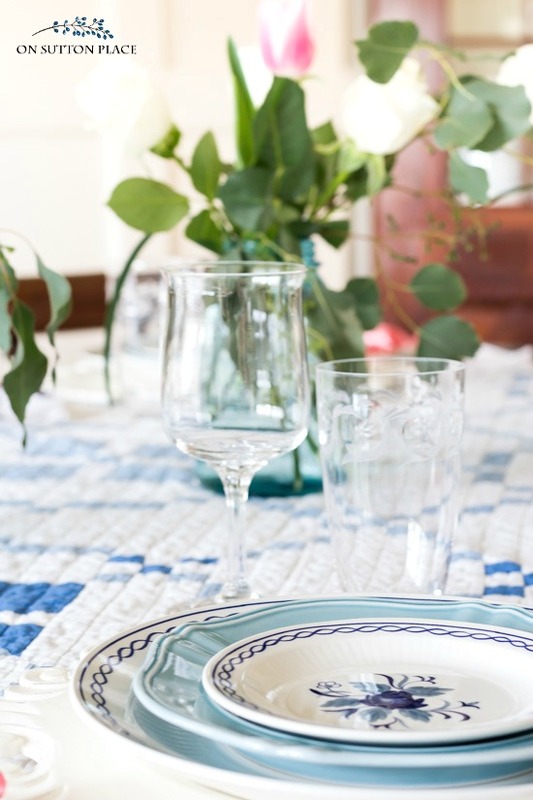 This tablescape started with the quilt. I wanted something different…something I’ve never used before. I thought about buying some pretty pink placemats or napkins, but decided to try and design this tablescape with things I already had. This quilt is usually hanging on my blanket ladder or covering up Kelly on the couch, (Don’t worry…I washed it before I put it on the table!) I can’t believe I never tried it as a runner before. I think it’s perfect. Since the quilt is blue and white, I stuck to those basic colors for the place settings and flower vessels. My only touches of Valentine’s Day are the tiny pops of pink. 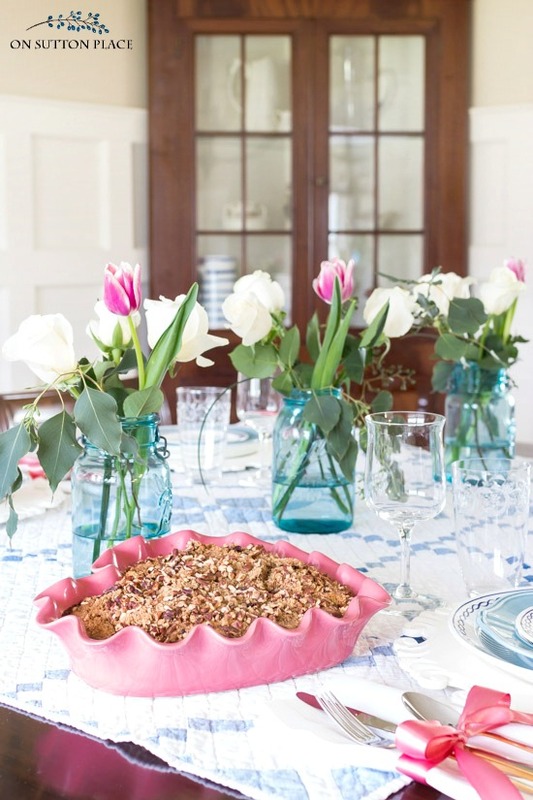 I used one pink tulip in each mason jar and tied a pink ribbon around the flatware. I also made a coffee cake in my new heart baking dish that I’m absolutely in love with. I’ll be sharing the coffee cake recipe next week and also hope to make a sugar cookie cake as well. You’ve seen the stemware and glasses before but I don’t believe I’ve ever used them together. The stemware is my wedding crystal and the glasses came from my in-laws. I think they make a perfect pair. I picked up the ivory roses and tulips at the grocery store. (Click HERE to see my tips for arranging grocery store flowers.) Three roses, one pink tulip, and a sprig of seeded eucalyptus went into three vintage mason jars and I was finished in about ten minutes. Flowers in mason jars are pretty much a no-fail way to make a centerpiece. Anyone can do this! 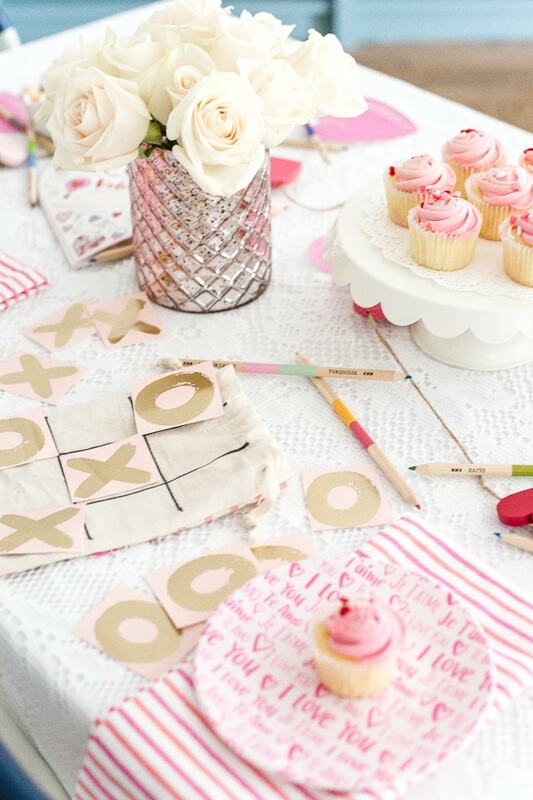 To sum things up: Farmhouse Inspired Valentine’s Day Tablescape Ideas you can use anytime! Use what you have. If the colors aren’t exactly right, add small accessories in the color of the season. In this case, I added pink for Valentine’s Day. 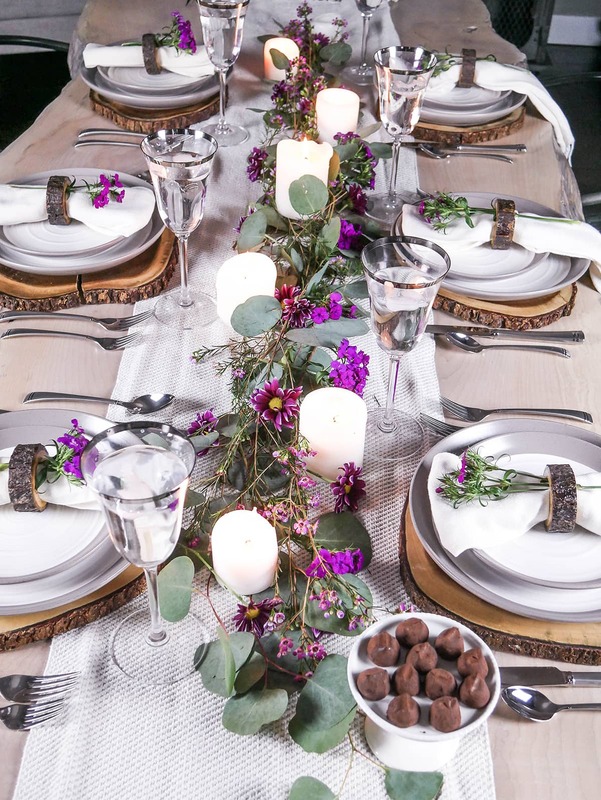 Think outside the box when it comes to table linens. Consider using throws, quilts, blankets, scarves, sheets, etc. Invest in a very basic set of cloth napkins in a neutral color. 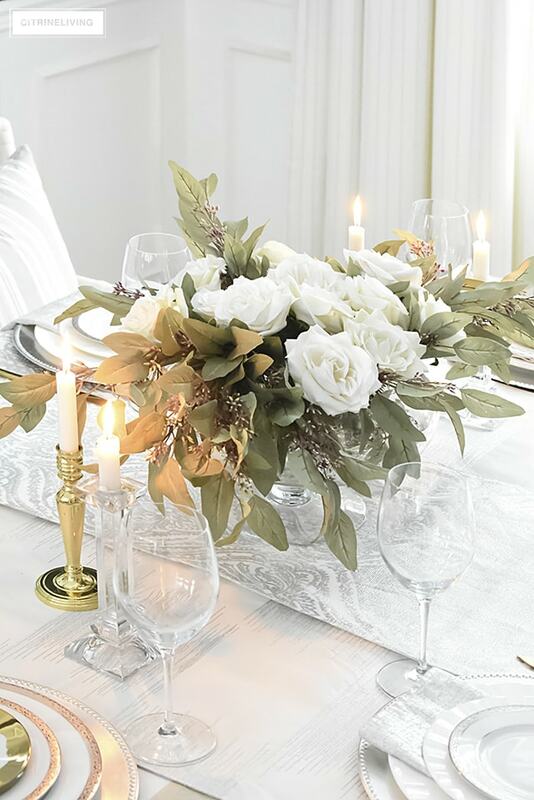 Get grocery store flowers and design a very simple centerpiece. Go ahead and mix styles. 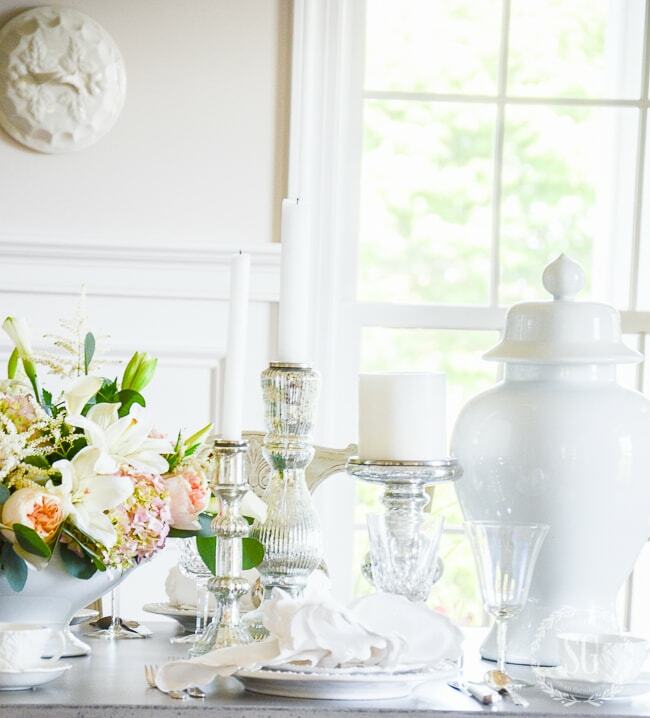 Combine vintage crystal with new flatware. 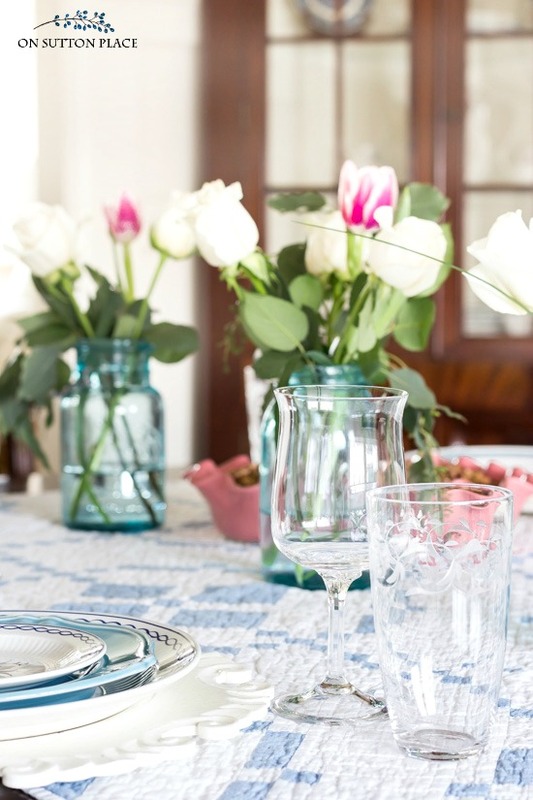 Use new napkins with a vintage runner or tablecloth. Mix metals and textures for added interest. 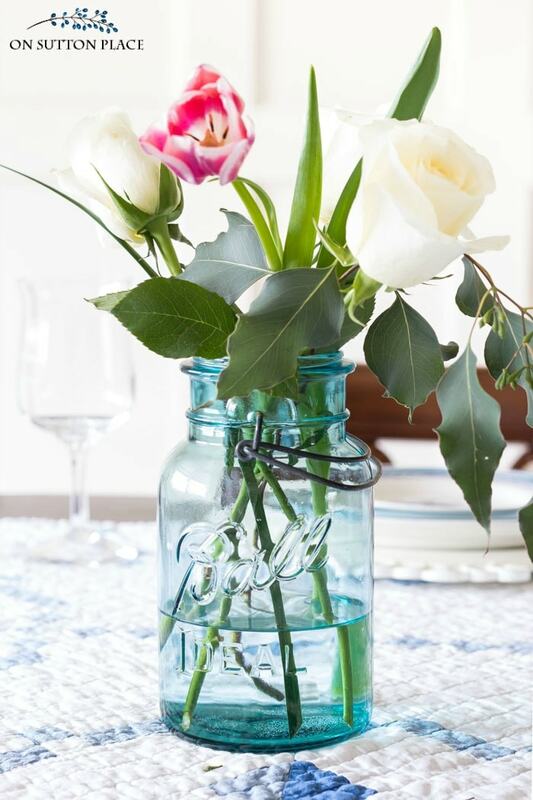 To get a free watercolor printable of the mason jar arrangement pictured above, click HERE! Stemware, glasses & quilt are vintage. Vintage blue and white plates: Adams Ironstone in the pattern Baltic. If you enjoy red on Valentine’s Day, click HERE for my tablescape from last year. It’s full of touches of red. Now it’s time to send you along to Taryn Whiteaker. If you don’t know Taryn, you are in for a treat because she’s not only super talented, she’s one of the nicest bloggers I know. Please click over and take a look! Lovely ideas! You mention where you purchased the solid blue plates, but where did you get the small white with the darker blue flowers plate? Ann, as my birthday is on Valentine’s Day ( 60…ugh! !… Where did the decades go.. 😣🤔), I have really enjoyed your lovely prints and tablescapes! As a result, I have subscribed to the French Boutique Cottage newsletter to see what her newsletter has to offer. The tours were all lovely!! Thank – you for sharing your talent and creativity with us!! So pretty! A refreshing color choice for Valentines! I always appreciate your clean and simple design style! 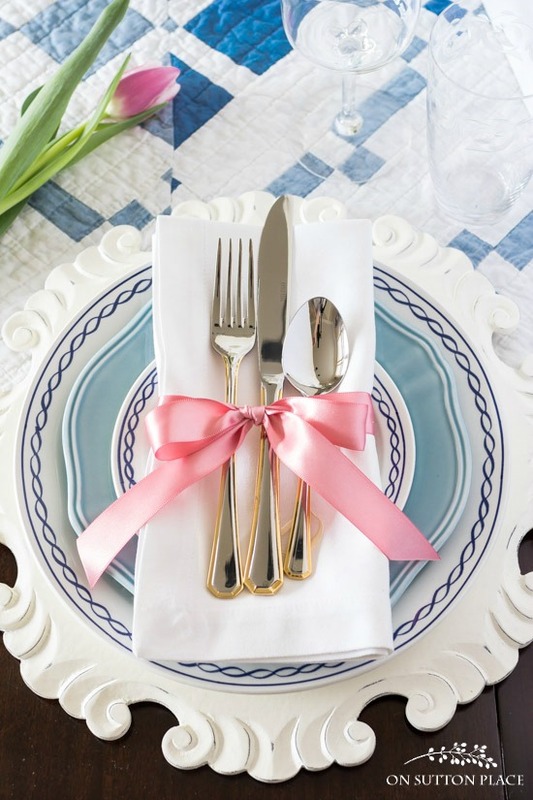 I love the quilt as it looks on the table with all the dishes and the simple and elegant decorations. Is it pre-treated to not stain? Can that be done with a vintage quilt without harming it? I’ve never yet had a dinner party where someone hasn’t spilled something on the tablecloth or runner and it’s not easy to get the stains out. I would hate to ruin a beautiful quilt in this way. The only time I’ve seen a quilt used during dinner was when it had a big piece of plastic covering the whole of it! No…the quilt isn’t treated with anything. I use my vintage quilts all the time. Inside the house and even outside on my porch. If someone spilled, I would do my best to get the stain out of the quilt and leave it at that! 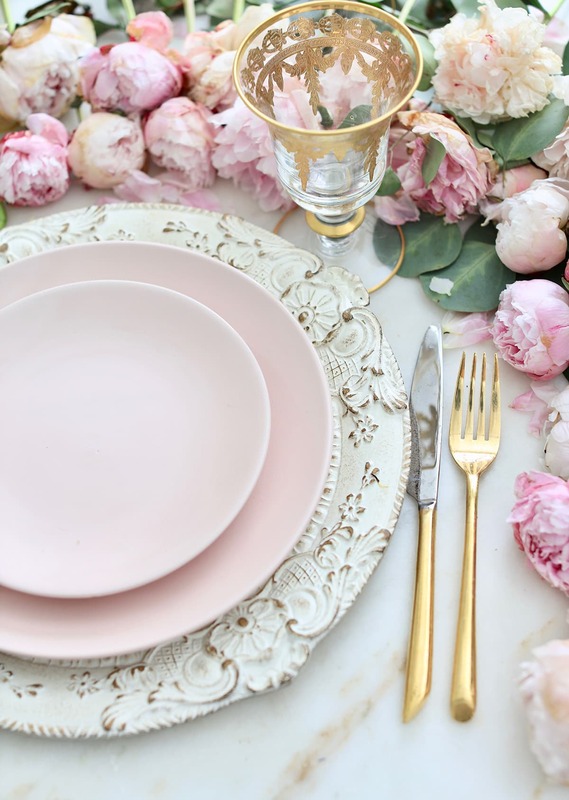 I think this is a beautiful tablescape! Love the non-traditional blues, with just the touches of pink. I also love the design of your chargers. That’s a style/pattern I’ve not seen before and they remind me of reclaimed corbels. Just lovely! All of it! lovely! where did you find those chargers!!!!!????? Hi Debbie…the link is at the end of the post. They are from Pier1! Love the blue and white dishes layered on your carved chargers! It’s just stunning. Gorgeous tulips. So pretty Ann! 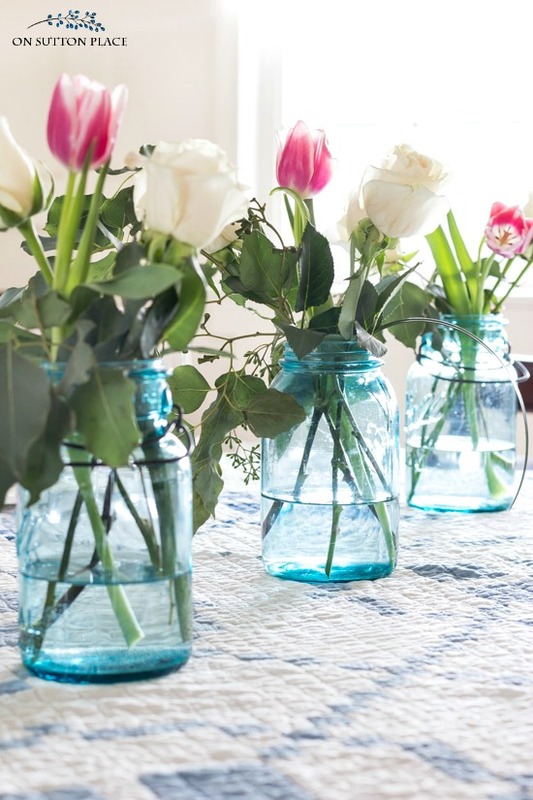 I love love those blue mason jars with the tulips! Lovely and cheerful, Ann! Thanks for sharing your creativity with us. Love the blue. Love the quilts. Love the touches of pink. It’s so practical, yet beautiful! 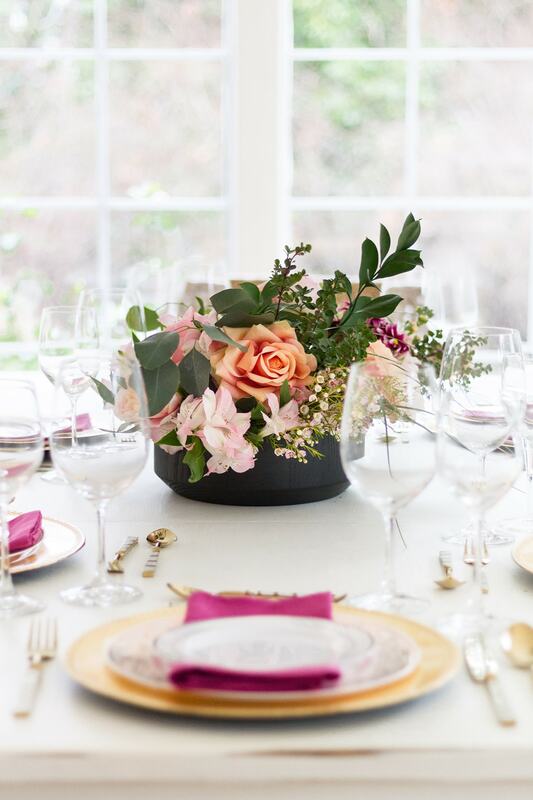 Lovely table Ann,always love keeping it simple and elegant. Very pretty! Would you please check the link to your pink baking dish? It seems to take me to the blue jars sold on Etsy. Thanks for the ideas! Oh thank you! I so appreciate you letting me know. I just fixed the link. Here it is: https://rstyle.me/n/cw2uv4b4svx You can get free shipping with the code SHIP4FREE. Pretty, pretty, pretty! Love it! Your table setting and flowers are lovely. 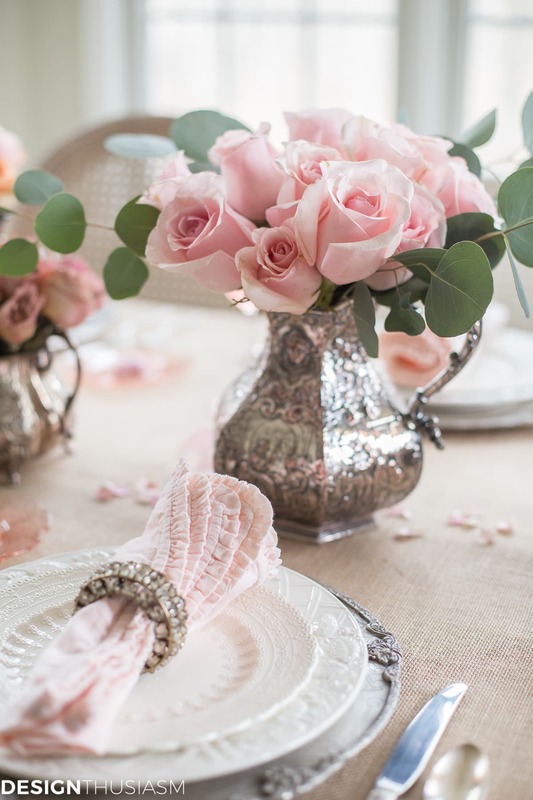 I love a beautiful table setting. We are in the process of adding a dining room addition onto our house. I inherited some beautiful china, tablecloths, crystal, etc. from my in-laws and can hardly wait to have a dining room and use these things. Seeing all these beautiful tablescapes has really inspired me. Cannot wait to get the table out of the kitchen and into a proper dining space. I love flowers in mason jars. The tulip/rose combo is just beautiful. Oh I love what you did, the pink with the blue and white! A breathe of fresh air!